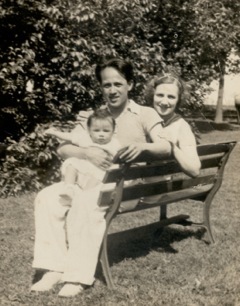 Gregorio Marquez with daughter Dolores on his lap and wife Fran at his side, taken in 1936. This bonus episode features our very own Lola Milholland. She tells a story from her childhood about her grandfather Gregorio (Goyo) Marquez and his compulsiveness towards Popeyes Fried Chicken. Next week, Underground Airwaves will be back in its normal format. Until then, enjoy this bonus! And look for future bonuses on the rare occasions when there’s a 5th Monday of the month. This story was recorded in Lola’s basement in Northeast Portland.